Corales 50 is ideal for a family or couples who want a resort experience without sacrificing privacy. It’s near the beach, golf courses, malls, and the airport, plus there’s gorgeous lounges all over the villa itself so you never have to leave. Your guests can relax in solitude, as the bedrooms are spread out across two levels and a guest house. Resort villa with ocean and golf views! Corales 50 is located in Punta Cana Resort, one of the most exclusive neighborhoods on Dominican Republic. Mesmerizing ocean views, waving palm trees, and rolling golf courses, set the scene for a gorgeous tropical vacation. A cobbled entrance and fountain point the way to the main house, the guest house, and the elegant pool. 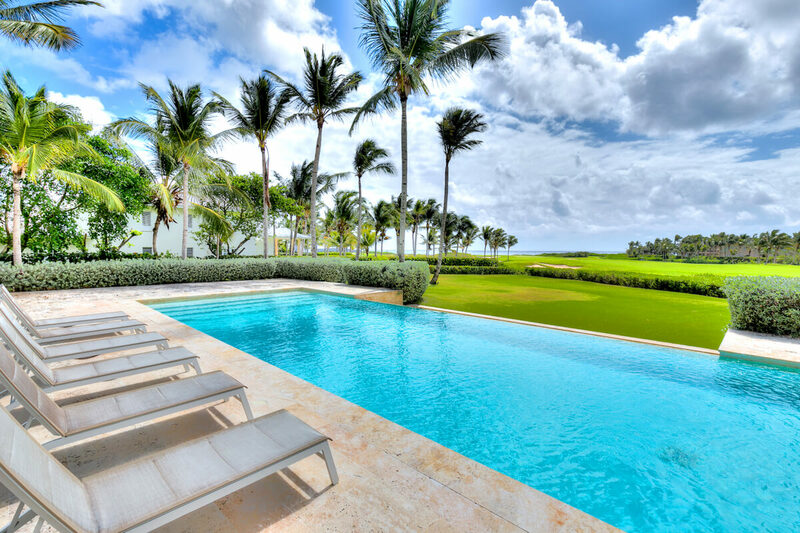 The sleek lap pool enjoys extensive golf course views and conveniently placed loungers. The open-air living room offers warmth and comfort with chic furnishings, a dining table, and lanterns. A hammock hangs between two palm trees nearby. Two tall coralina columns lead into the open-concept main house. Two staircases on each side of the entrance lead up to the second floor. On the main floor, the living room invites guests to lay back and relax in the plush sofas and sophisticated rattan chairs. The pastel blue dining room offers a large hardwood table for 12 and a modern, minimalist chandelier. The fully equipped kitchen features marble countertops, a double-door fridge, a breakfast bar, and stainless steel appliances. On the second floor, there’s a high-ceiled media room with a flatscreen cable TV, comfortable sofas, a study, and a library. This room opens to the wraparound balcony with ocean views and plentiful furnishings. On the second floor, the master bedroom features a king bed and an ensuite bathroom. The second bedroom has a king bed and an ensuite bathroom, and the third bedroom has two full beds and an ensuite bathroom. On the first floor, the fourth and fifth bedroom each have a king bed and ensuite bathroom. The guest house suite has two queen beds and an ensuite bathroom. Each suite has exterior access to the patio or balcony. Two housekeepers maintain the villa daily. Corales 50 is nestled between the beach and two golf courses. Punta Cana Village is nearby as well, and offers a mall, supermarket, CrossFit, and a hospital. The airport is also within a short drive. Corales Beach is an approximate 2 minute car ride from villa.